(15/P52) TRENTON – Cheesequake State Park will mark its 75th anniversary with an array of festivities open to the public on Saturday, June 6, Department of Environmental Protection Commissioner Bob Martin announced today. The ceremonies will focus on the people who have made the park, located in Old Bridge, Middlesex County, a success, from past and current employees to the many patrons who have visited since then-Governor Harry Moore officially opened the park on June 22, 1940. Saturday’s event begins at 10 a.m. on the lawn next to the lake and will include speeches, followed by tours with park naturalists and historians. The day’s events, which end at 12:30 p.m., will focus on the longstanding mission of Cheesequake, as well as its early history and the importance of its diverse ecology in an area that is easily accessible to people from across the region. The 1,274-acre park has become known for being in a transitional zone between northern hardwood forest and southern Pine Barrens ecosystems. 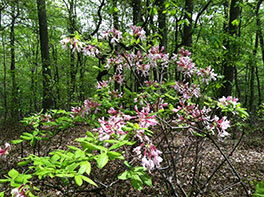 Located near Raritan Bay, the park boasts salt and freshwater marshes, open fields and a white cedar swamp. The name Cheesequake is derived from the Lenape word Cheseh-oh-ke, meaning upland or "upland village.” The park is home to more than 160 species of birds and a wide variety of trees, including Atlantic white cedars, red maples, black birches and sweet bay magnolias. 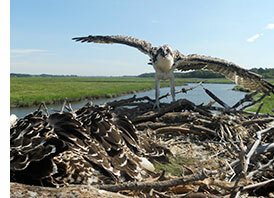 The park also boasts eight productive nests for osprey, a species once threatened by now-banned pesticides and habitat loss. In the early 1950s the park was bisected as a result of construction of the Garden State Parkway, which today provides the park with its easy accessibility. The first campsites were created in 1962 to handle overflow visitors from the World’s Fair in New York City. After celebrating the nation’s first Earth Day in 1970, a nature center was built to help visitors understand the park’s varied ecosystems. “This is a great place to start your visit, to learn what the park has to offer,” said Park Superintendent David Donnelly.